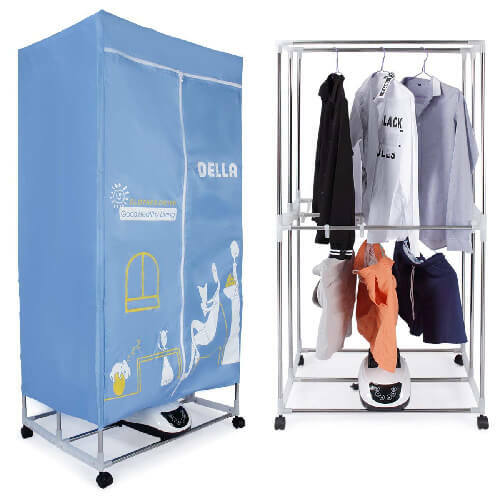 This article is part of our series on Portable and Compact Clothes Dryers. We’re looking at different options for people that don’t have space or hardware in their home or RV to use a traditional tumble clothes dryer. We’ve also covered compact 110V tumble dryers and electric spin dryers. In this article, we’re covering electric hanging clothes dryers, which are heated racks which help dry your laundry faster than merely hanging it. Dry laundry quicker than hanging alone. Portable racks can be folded up and stored away. Low power. You don’t need a 220V outlet for a drying rack! Cheaper than buying a full-size tumble dryer. Gentle on your clothing and ideal for delicates. Uses less heat than a traditional dryer which helps extend the life of fabric. 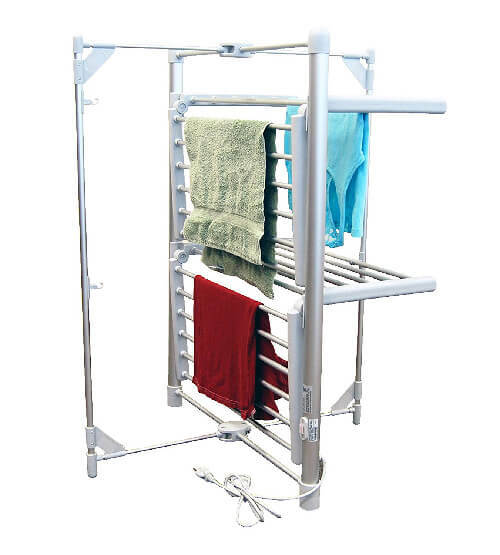 Portability is the most appealing feature for most people considering these types of drying racks. If you have a small studio apartment or travel in a camper or RV, then being able to pop out of these dryers is very handy for avoiding laundromats. Often there are clothes we simply don’t want to put into a traditional dryer since they’re too delicate. These hanging racks are ideal for these situations, and they use a minimal amount of heat to dry laundry. If you forget to pull your clothes out of your tumble dryer immediately after they’ve finished drying, then you always end up with wrinkles. Hanging dryers help minimize wrinkles just as a byproduct of their design. Check out the top recommended models in our comparison table below. We’ve got more details about each model in the following section. The Panda is a popular model that’s smaller than the Manatee and has a substantial 22 lbs capacity. Drying times for a full load typically should be around 2 hours. This really depends on the environment the heater is being used in. If you’re in an air-conditioned apartment, then you can expect it to dry faster as the ambient air is less humid. However, if you’re in a camper and decide to put it outside in relatively humid air, then it will take longer. The heater used with the Panda is 900W, which will be noticeable in small spaces. For example, if you decide to run the Panda in your camper, you will likely notice your AC unit competing with the heat. In the winter, these drying racks are more of a blessing than a curse, so if you live in a small studio apartment or camper you might look forward to hanging laundry. This is the highest capacity drying rack on our list. 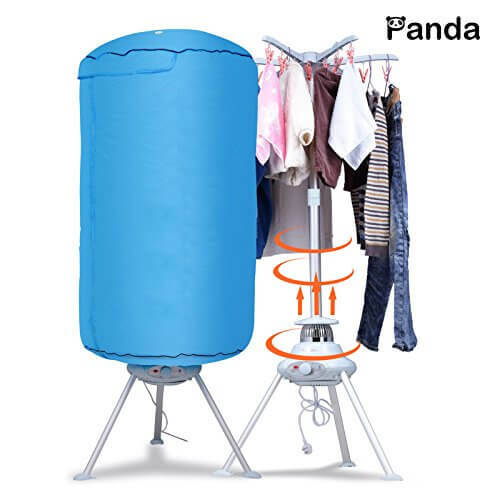 It has a slightly higher wattage heater than the Panda model and can hold about 50% more laundry. 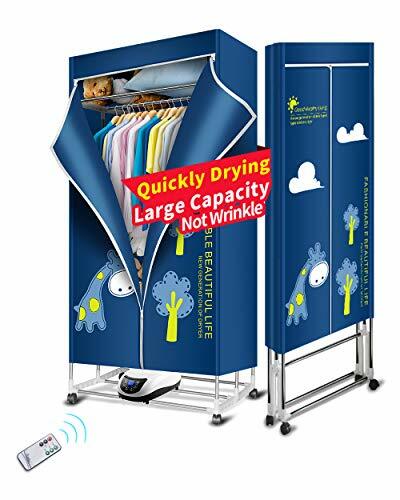 Drying times will increase when you completely pack the rack with clothes, but you can expect 2 to 4 hours to dry a medium to large load of laundry. The Kasydoff is large enough to be used as the primary dryer for a small family if you don’t get too far behind and need to dry a bunch of clothes in a pinch. Check out this terribly translated video to see a demo of this portable dryer. One thing to remember with these dryers is not to put dripping laundry on the rack. After all, there is an electric heater sitting below it. If you need to run an extra spin cycle on your washer or use an electric spin dryer from our guide linked at the beginning of this article. These heated hanging racks are a great way to finish up drying laundry after running them through a spin cycle on a compact spin dryer. Folds into a depth of 3 inches. This rack by LCM is freestanding, not wall-mounted. You get 2 tiers with racks that can fold out and give you more hanging space. You won’t need hangers or clips with this style rack. There is no enclosure for this rack, so having a ceiling fan or box fan in the room will help circulate air. You won’t see drying times as quick as the Manatee or Panda model. Due to the ease this rack collapses you can easily tuck it behind a door or against a wall when it’s not in use. The Della rack is comparable to the Manatee model above in terms of overall size and capacity. If this is the size rack you’re looking for, then it just comes down to price. You can expect drying times between 2 to 4 hours with larger loads on the longer end of that range. Lightweight fabrics will dry faster, and for heavier materials, it is a good idea to run them through an extra spin cycle on your washing machine. Room for 3 hangers inside and a single shirt or jacket outside. This product is a bit strange when you first look at it, but its purpose is to dry shirts and pants. You can hang pants on the inside of the plastic with a shirt on the outside. A potential use for this product is if you’re traveling and don’t want to deal with a laundromat or you find out your hotel’s dryer is out of service and need a shirt dried in a pinch. If you’re looking for some other options for hanging racks, then check out our article on wall-mounted clothes racks. They’re a great way to keep your clothes racks off the floor and out of the way. Many of them can be folded up and hidden from sight with no effort. Compact clothes dryers come in many forms so if you’re coming here and are wanting to see more options, then be sure to check out our buying guide for portable and compact dryers. There are many more options out there for campers, RV’s, and small homes.